Remove shells from cardamom pods and add to a mortar, along with cloves, star anise, crushed cinnamon stick, allspice berries, and anise seeds. Using the pestle, grind up all of the spices. Then, zest orange, add to the spices, and grind again. Mix with sugar and transfer to a sealable glass jar. 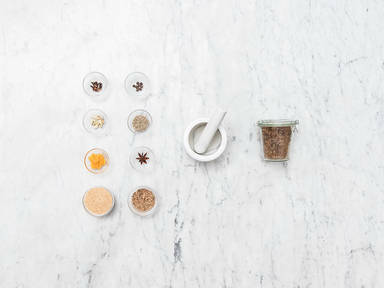 Add spice blend to 1 l wine for a delicious batch of mulled wine!